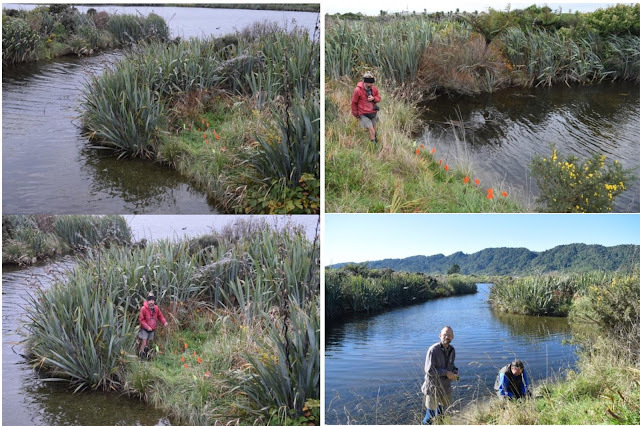 Mike Hickford and I recently visited Greymouth to assist the community-based restoration project at Cobden Island. It was immediately obvious that the project has made great progress! A complex network of channels has been 're-engineered' into the floodplain landscape of Cobden Island and is now the subject of planting and other restoration work. The nearby Aromahana Lagoon shoreline is being restored to improve habitat for indigenous species whilst incorporating a track system and other recreational amenities. Although our visit was restricted to scoping out logistics for the design of future field surveys, we did manage to find two īnanga spawning sites on the upstream side of the Aromahana Lagoon outlet structure (on both left and right banks). These are new records and although small in spatial extent they are likely to see repeat use. They will be also be good demonstration sites to engage the public and should be monitored to ensure the condition of the vegetation is suitable.